The very on-trend Fiddle leaf fig has large glossy green leaves and looks great in a large pot. It is low maintenance and suits indirect sunlight. Be aware that the Fiddle leaf fig is a slow grower and the lower leaves will drop if it is watered too much - go easy! Staghorn and Ekhorn ferns are great wall features and look amazing mounted on an internal wall. They are a fun play on the current trend to display deer busts and horns/antlers in homes. Staghorns grow large as individual plants; the Elkhorns grow in groups (and the Elkhorns are a tougher plant). Both ferns don't like too much fertilizer. Keep them moist with a weekly soak during summer and leave them dry in winter. Stunning! The Cunjevoi is a large-leafed ‘elephant ear’ type plant. Leaves flow from the centre creating an umbrella shape though lower branches can be trimmed to force the growth more upright. These are fast growers and will thank you for fertilising. But beware - they are harmful if eaten, so best not to keep indoors around children or plant-eating pets! Kangaroo ferns are great as indoor plants as they naturally require little light - their natural home is the rainforest floor. Maidenhair ferns were very popular in the 70’s, but the modern Kangaroo fern is much more contemporary with its strong architectural structure. This is a low-growing plant, spreading to 300-400mm and is perfect for large, low containers on the floor or as a live display on a table. Keep the kangaroo fern moist. The carnivorous Pitcher Plant is a very interesting plant, conversation starter. It is striking as a feature and looks great as a table display - a terrarium is a particularly interesting option. Keep your Pitcher Plant moist. The MONSTERA deliciosa is a large-leafed climbing plant that gives a great mid-century modern feel to an indoor space. Grow in a low pot with trellis (such as a bamboo pole). The attractive split leaves can also be cut and displayed in a vase. The more indirect sunlight the plant receives, the greater the number of splits. This is a great low maintenance plant and requires water only once a fortnight. Love these plants? 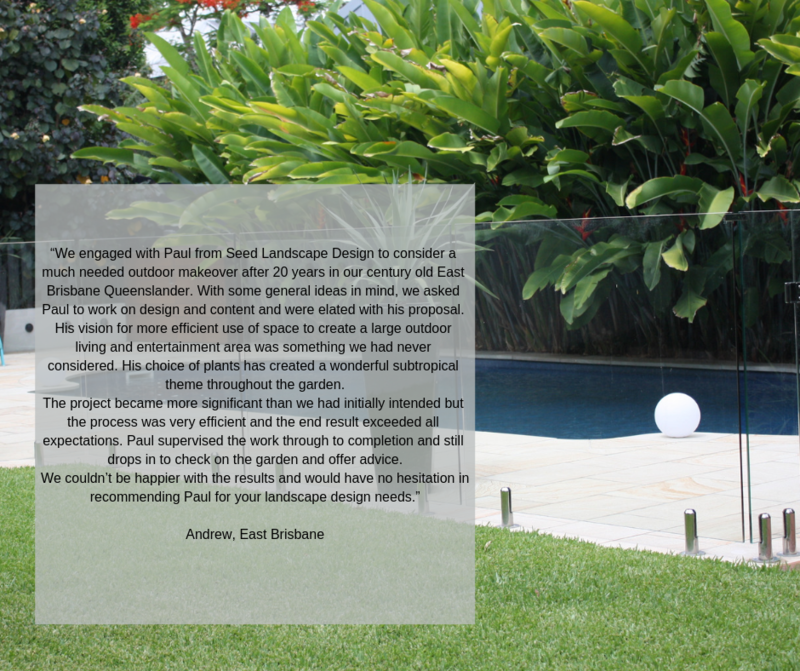 Get in contact with SEED Landscape Design to help you create a sustainable, design-oriented landscape for your property in the Brisbane greater area.